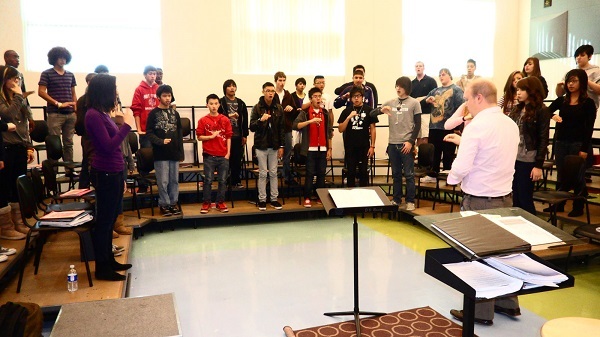 The term ‘just intonation’ is a sometimes muddled and confusing idea that may seem more like a concept than a tool for practical application for many high school choral directors. However, in its most basic sense, just intonation is a system of natural tuning which allows for efficiency in the choral rehearsal by exploiting the ears ability to hear the natural overtones of the harmonic series. Armed with a small amount of knowledge and a few basic concepts, just intonation can allow for beautiful and efficient music making. Overtones and the harmonic series have been explored by musicians and mathematicians since the time of the Ancient Greeks. However, since the rise of equal temperament and the use of the piano in choral rehearsals, its use in the choral rehearsal has decreased. Overtones are often discussed, but in my experience this is usually in reference to hearing them as a phenomenon, rather than as a goal or a tool. Overtones, also referred to as “partials” of the fundamental, are produced when a resonant system (such as the human voice) is excited. More specifically, when a singer sings with a full, well in tune and resonant tone, overtones will form above the fundamental. While overtones can be heard well beyond the 5th partial, the use of a low limit harmonic lattice will help to outline the overtone series and provide for its efficient use (for more information on this system, see “The Harmonic Experience” by W. A. Mathieu). The five-limit harmonic lattice diagrams the notes surrounding a tonal center, organized through third and fifth partial relationships (or intervals of a perfect fifth and major third, respectively). For an example of this lattice, see Figure 1. The process of “warming up” is important to every choral rehearsal, but not simply to prepare proper vocal function. These vocalisms should be an opportunity to rehearse audiation skills and to create an atmosphere rich in harmonic understanding (audiation is a term defined by Edwin Gordon as the foundation of musicianship, which takes place when we hear and comprehend music for which the sound is no longer or may never have been present). Knowing that the equal temperament tuning of the piano is slightly unnatural for the human voice, a conductor can slightly vary their approach to warm-ups to enhance the harmonic series. Rather than playing the third of the triad (which when played on the piano will be slightly sharp of the just intonation), conductors can play the second and/or fourth scale degrees. These notes each share 3rd partial relationships to the tonal center, meaning – as you can see in figure one – when approached in harmonic order, they will all be in relationships of a perfect fifth. Because 3rd partials are the lowest harmonic audible to the ear, besides the octave, these relationships are the easiest to hear. While most young choirs utilize scales (or at least scalar material) as a part of their warm-up process, the use of the Church modes is far less typically found. Teaching these modes and implementing usage in rehearsal can enhance a choir’s knowledge of harmony and intonation. Teaching the modes in order from the bright to dark (Lydian, Ionian, Mixolydian, Dorian, Aeolian, Phrygian) will encompass all the notes of the chromatic scale, and provide an avenue for expressing tone colors present in different harmonic structures. Coupled with Curwen hand signs, which provide a method to reach your kinesthetic learners, use of the modes will provide a rich harmonic palate from which your singers can draw. Many conductors would suggest that when singing music that is a cappella, perhaps the piano should be removed from the rehearsal. Knowing that the piano is not justly tuned, playing parts on the piano will result in tuning that is not exactly in line with the harmonic series. However, because the relationship of a fifth is relatively close to just intonation on a piano, it is possible to enhance intonation of a cappella music by the playing of a drone. This does require careful score study on the part of the conductor to determine the tonal center of a song, section, or phrase. However, once this tonal center has been established, a choir can use a drone to tune chords to this tonal center, rather than simply tuning to the other notes in the chord. For example, if phrase is centered around C, not every chord in the phrase will include a C. An e minor triad would be a common chord in the key of C. If you are playing a drone of an open fifth (C – G) while the choir sings an e minor chord, the choir will be able to tune to the tonal center rather than just to the notes of the given chord. This allows for a more just relationship of tuning. When this is practiced in rehearsal, choirs can “audiate” this drone during rehearsal or performance when the drone has been removed. In much the same way that this drone would be used in warm-ups, we can use it in singing a full a cappella choral piece (or at least any section of the piece which retains a consistent tonal center). The ability to reference to this chord can enhance a choir’s ability to tune. Further, the same concept can be found in accompanied choral music if the music is carefully selected. If you want to select accompanied music that will most readily allow you to continue to reinforce just intonation, consider the following: (A) avoid accompaniments that double the vocal lines, and (B) accompaniments that feature pedal tones or drone like features will function in much the same way that playing a drone will for a cappella music. In a youth choir setting, it is unreasonable to assume that each of your singers will understand the theory behind the overtone series when they enter your first rehearsal. They may not even know enough music theory to understand the structure of chord or triad. However, this does not prevent you from using this knowledge to your advantage. Simply by building your chords in harmonic order will allow you to exploit the natural efficiency of the overtone series. Rather than building this chord in score order (from bass to soprano) the chord should be sung by the choir in harmonic order, that is, F – C – G – D – E. When there are multiple parts singing the same pitch, the first pitch sung should always be in the lowest octave available. The idea is that when the F is sung, the C will be present in the air and audible to the ear as an over-tonal third partial. By listening for this pitch, the choir can find a pitch to sing that is much more truly in tune than the pitch as it would be played on the piano. As each part enters, it is important for the singers to listen to the part that was sung before it and to tune to that pitch (thus as the tenor one part prepares to sing a D, they will be singing a fifth above a G rather than a whole step above a C). I should quickly clarify that this practice is meant to be for the process of tuning the chord, and that this does not imply any changes to the chord itself or to the way it would be sung in performance. This practice simply allows for the choir to hear the chord in a different way which reinforces the natural tuning of the harmonic series. While many of these suggestions are a large over-simplification of overtones and of just intonation, each of these are tools which will allow you to improve the overall intonation of your ensemble. This will give your singers a new avenue for listening and audition, and ultimately can lead to beautiful music making. Because just intonation exploits the tones that are naturally present in music, this will also lead to efficiency in tuning and in vocal production. It has been my experience that young singers become quickly fascinated with these practices. When they hear chords in a new way, they begin to describe music with an entirely new vocabulary. My students have an entirely new color palate that they use to describe the music they make. Without having to explain the science of harmonics students begin to see the results of their attention to detail in harmony. Perhaps most importantly, these tools allow for efficiency in vocal production and in rehearsal time, and I am sure we can all appreciate something that makes things work a little bit more smoothly. Author’s Note: A great deal of thanks is owed to my professors and colleagues in the Three Summer Choral Master’s program at CSULA, without whom this article would not be possible.